Lt. Gen. Ashwani Kumar, AG and Prof. Talat Ahmad, Vice-Chancellor, Jamia Millia Islamia University, exchanging the MoU for academic collaboration, in New Delhi on September 28, 2017. 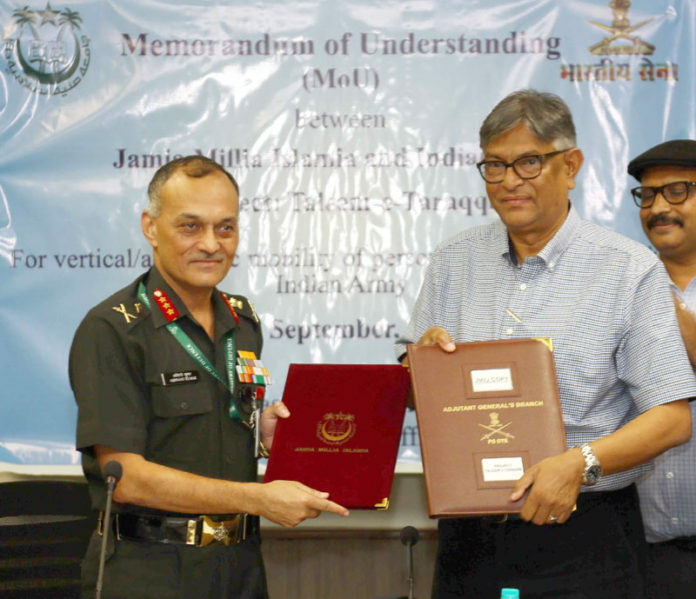 New Delhi : Indian Army and Jamia Millia Islamia University (JMIU), New Delhi recorded their mutual intent for academic collaboration, technical advancement and progression of Army Personnel, in a MoU signed on 28 Sep 2017 between Lt Gen Ashwani Kumar, Adjutant General, IHQ of MoD (Army) & Prof Talat Ahmad, Vice-Chancellor, Jamia Millia Islamia University (JMIU). The University agreed to recognise the in-service courses run by the Army. This would facilitate admission of defence personnel in second or third year Graduation/Post Graduation/Doctorate programme through the medium of distance learning. This would enable the soldiers to enhance their academic qualification for a better future.